We previously looked at research suggesting that a well-planned, low-carb diet coupled with exercise can help you lower blood sugar, triglycerides, and body weight and also improve HDL cholesterol and insulin sensitivity. But what impact does ketogenic diet have on blood pressure? Recent research suggests that maintaining an optimal blood pressure is even more critical for your heart and overall health than previously thought. Read below to learn how cutting carbs and keto may be a good tool in maintaining a healthy blood pressure. Before looking at the research, we need to straighten out the sometimes intimidating terminology behind blood pressure. 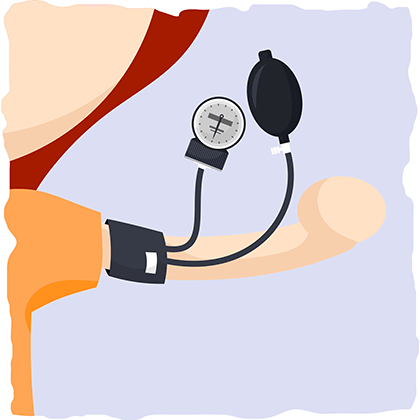 Blood pressure, often shortened as BP, is the pressure exerted by blood upon the walls of blood vessels. Typically, it refers to the pressure exerted upon arteries which are the vessels that carry blood away from the heart. As you might know, BP is usually expressed as one number over another. The top number, called systolic pressure, refers to the amount of pressure in your arteries when your heart contracts. This is the maximum pressure exerted upon the walls of the blood vessels. The bottom number, called diastolic pressure, indicates the pressure in your arteries between heart beats. This value is lower than the systolic pressure because the heart is exerting less force on the fluids against the artery walls. Both pressures are measured by the units “millimeters of mercury”, which is abbreviated as mm Hg. According to the American Heart Association (AHA), the “standard” human blood pressure is 120/80 mm Hg. Healthy blood pressure is typically below these numbers. People with a systolic blood pressure between 120-139 mm Hg and a diastolic blood pressure between 80-90 mm Hg typically have a condition called prehypertension. If left unchecked, this can progress to hypertension, a condition in which blood pressure is consistently over 140/90 mm Hg. Over time, this can lead to a variety of clinical complications. An estimated one-third of American adults- or 70 million people- have hypertension. But only about half of these people have it under control. Starting at age 20, the AHA recommends getting a blood pressure screening at your regular health check-up or physical. If your blood pressure is consistently in the prehypertension or hypertension range, you should consider creating a treatment plan with your doctor. Many methods can be used to treat hypertension and maintain a healthy blood pressure. Doctors, dietitians, and researchers have consistently looked at how diet can be utilized to manage high blood pressure. Additionally, a well-balanced diet can easily be coupled with exercise, effective medications such as Lisinopril, and complementary treatments such as yoga. However, there has been some confusion as to which kind of diets are most effective in managing high blood pressure. Recent research shows that a low-carbohydrate, ketogenic diet high in healthy fats be a useful tool in managing hypertension. Below we document the evidence. How do Low-Carbohydrate Diets Stack up Again Other Diets? A study from 2007 published in the Journal of American Medicine, one of the most highly-regarded medical journals, compared the impact of low-carbohydrate diet and three other diets on blood pressure and other measures of cardiovascular fitness. In a 12 month randomized trial, researchers recruited 311 overweight/obese, nondiabetic, premenopausal women. Participants were randomly assigned to one of four groups. The first 77 were asked to consume a low-carbohydrate Atkins diet where they aimed for 20 grams of carbohydrate per day or less for a 2-3 month “induction phase” followed by 50 grams of carbohydrates per day for the next 9-10 months. The next 79 were asked to eat “the Zone Diet” which emphasized a 40%, 30%, and 30 % distribution of carbohydrate, fats, and protein respectively. A group of 79 followed the “LEARN Diet”, which included 55% to 60% of energy from carbohydrates and less than 10% of energy from saturated fats. Additionally, it emphasized behavioral modification and physical activity. The final 76 subjects consumed the Ornish Diet which contained no more than 10% of calories from any type of fat. 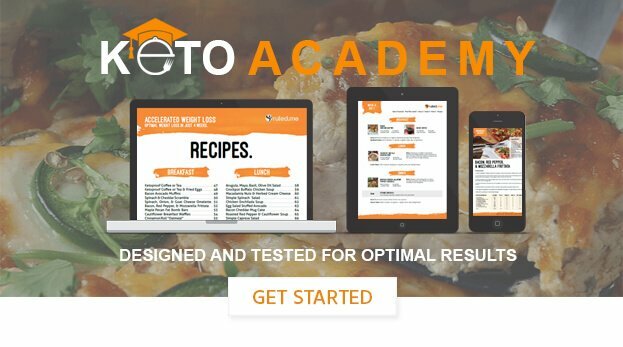 All subjects were asked to maintain a calorie deficit and received professional support when adjusting to their new diet. Additionally, general health-promoting recommendations in physical exercise, nutritional supplements, and behavioral changes were provided to all participants. The average blood pressure of all the subjects was 117/75 mm Hg. After the 12 month trial, all subjects who successfully completed their respective diet experienced notable reductions in body mass, triglycerides, and LDL cholesterol. Those in the Atkins group, however, had the greatest declines. 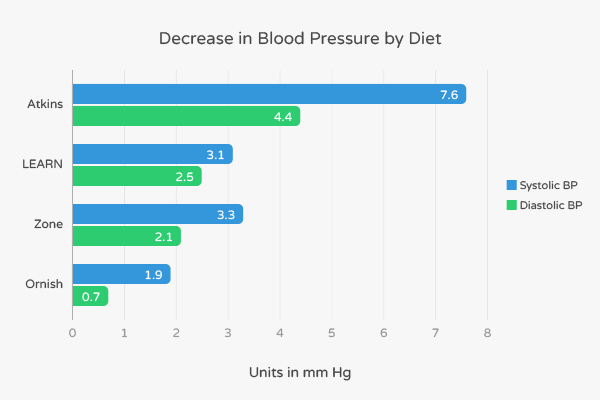 In contrast, the participants who ate the Atkins diet successfully decreased their systolic blood pressure by an average of 7.6 mm Hg- twice more than any other group. Similar trends were observed in diastolic blood pressure. They also mentioned that the “concerns about adverse metabolic effects of the Atkins diet were not substantiated within the 12-month study period.”  Thus, a low-carbohydrate diet coupled with healthy fats may be an effective and sustainable way to lower blood pressure. Ketogenic Diet: Better than a Pill for Lowering Blood Pressure? Most studies showing the ketogenic diet’s impact on blood pressure stack it up against lower fat alternatives. A team of research scientists headed by Doctor William S. Yancy decided to add another variable in the mix: the drug Orlistat. In their 2010 study, this team recruited 146 overweight/obese patients from the Department of Veterans Affairs primary clinic in North Carolina for a 48 week-long trial. These subjects had an average age of 52 years, 72% were men, and 32% had diabetes mellitus (defined as a glucose greater than 125 mg/dL). About 30% had hypertension. The researchers randomly assigned them to one of two intervention groups. The first group of 72, called the low-carbohydrate ketogenic diet (LCKD) group, consumed an average of 40-60 grams of carbohydrates per day and were asked to maintain a 500-1000 kilocalorie deficit of energy per day. The second group of 74 consumed a low-fat diet with 30% of energy or less from fat and the same calorie deficit. Additionally, they took three 120 mg of Orlistat per day. They were designated as the Orlistat + low-fat group. To compare the effectiveness of each intervention, the researchers measured key metabolic parameters including blood pressure and body weight. All subjects were asked to exercise on their own for 30 minutes at least 3 times per week and asked to drink six to eight glasses of fluids daily. At the conclusion of the study, 57 participants in the LCKD group (79%) and 65 of the participants in the Orlistat + low-fat group (88%). On average, both groups had similar levels of change in key metrics such as body weight and levels of triglycerides. These findings are more surprising given the fact that the LCKD group consumed, on average, 50-150 kilocalories more per day. Thus, the group eating a low-carbohydrate/ketogenic diet experienced a much more positive health outcome in regards to blood pressure. Does this mean if you have high blood pressure you should immediately drop your throw away your weight-loss/blood pressure drugs and switch to a ketogenic diet? Not just yet- you should first consult with your dietitian or doctor to see if cutting some carbs is a suitable strategy for you! 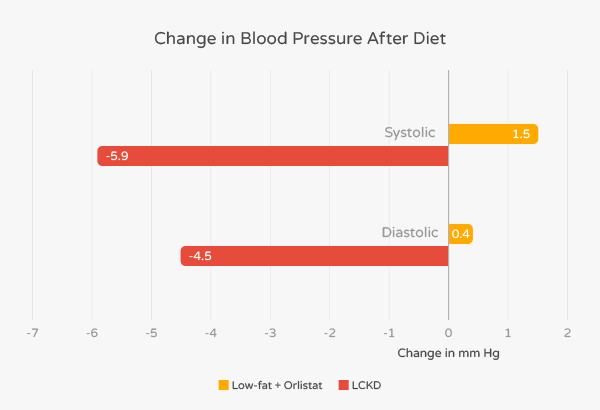 Key Takeaways: A recent trial showed that a low-carbohydrate diet with exercise was more effective in lowering blood pressure compared to a low-fat diet combined with the weight-loss drug Orlistat and regular exercise. Recommendations: If you want to use your diet to effectively reduce blood pressure, consider using a diet lower in carbohydrates and higher in fats such as the ketogenic diet. Consult with a dietitian or your primary care doctor to see if this is a safe pathway based on your personal health. Additionally, remember to maintain a healthy but reasonable calorie-deficit and participate in exercise if you want to see stronger results. In 2008, a group of Spanish researchers assessed how a Mediterranean twist on the diet would impact cardiovascular health. In their prospective study lasting 12 weeks, clinicians recruited 40 obese subjects (19 female and 22 male) with an average body mass index (BMI) of 36.46 and an average age of 38.48 years. Subjects had no calorie restriction to their diet but were asked to eat no more than 30 grams of carbohydrates per day. They were also asked to include at least 30 mL of virgin olive oil day, which contains about 255 kilocalories, and about 200-400 mL per day of red wine. Additionally, they were encouraged to eat green vegetables and salads as their primary source of carbohydrates and fish (except for large fish such as swordfish) as their main source of protein. Because these foods are typical of Mediterranean cuisine, the researchers referred to their diet as the “Spanish Mediterranean Ketogenic Diet” (SMKD). Of the 40 subjects who started the study, 31 (or about 78%) successfully completed it. On average, the subjects had significant losses in body weight, BMI, and LDL cholesterol. The average blood pressure in the subjects decrease substantially. Key Takeaways: A low-carbohydrate diet incorporating fats from olive oil along with vegetables and fish characteristic of the Mediterranean Diet leads to highly favorable changes in blood pressure, body mass, and body fat. Recommendations: If you are interested in lowering blood pressure, consider adopting a diet high in healthy fats such as olive oil and fatty fish along with vegetables for your source of carbohydrates. Do High-Carb Diets Equal High Blood Pressure? Because high-fat diets are often thought of as unhealthy, people often associate them with clinical concerns such as high blood pressure. However, a study from 2015 in South Korea calls that into question. In their cross-sectional study, researchers analyzed data from 34,003 Korean adults aged 19 years and older. The researchers divided them into three groups. The first group had a less than 15% of their caloric intake from fat; the second had between 15-25% of their daily caloric intake from fat, and the third group had more than 25% of their daily caloric intake from fat. Then, they adjusted for variables such as body weight to see if there was any association between dietary fat intake and the incidence of metabolic syndrome. The condition refers to set of risk factors including hypertension that increases the risk of heart disease, diabetes, stroke, and other chronic diseases. When analyzing the results, researchers noted that the prevalence of metabolic syndrome was about 1.27 times higher in the lowest fat group that the highest fat group. The low-fat group, on average, had higher levels of triglycerides and blood pressure than the highest fat group. These findings prove particularly interesting because “subjects in the low-fat group (≤15%) had much lower daily energy intake, by 500 kcal, compared with subjects who consumed high-fat diets (≥25%).”  Thus, despite consuming a higher amount of fats and calories overall, the higher fat group had better cardiovascular health as evidenced by a lower prevalence of metabolic syndrome. This suggests that a low-fat diet (below 25%) is less healthy for cardiovascular health than a higher fat diet and may increase the risk of hypertension. Key Takeaways: In a large-scale, observational study, lower-fat diets were associated with increased prevalence of high blood pressure and metabolic syndrome. Diets with a greater number of calories from fat were associated with healthier levels of blood pressure. Recommendations: When selecting a healthy diet for optimal blood pressure, it’s important to get a reasonable amount of calories from fat and not eat an excess amount of carbohydrates. If you are interested in reducing carbohydrates in your diet to fight hypertension or maintain a healthy BP, consult with your dietitian or doctor to see if it’s a safe plan for you. If so, feel free to check our website for great keto recipes! James, Paul A., et al. “2014 evidence-based guideline for the management of high blood pressure in adults: report from the panel members appointed to the Eighth Joint National Committee (JNC 8).” Jama 311.5 (2014): 507-520. Wright, Jackson T., et al. “A randomized trial of intensive versus standard blood-pressure control.” New England Journal of Medicine 373.22 (2015): 2103-2116. Yoon, Sung Sug, et al. “Hypertension among adults in the United States, 2009-2010.” NCHS data brief 107 (2012): 1-8. Franklin, Stanley S., et al. “Does the relation of blood pressure to coronary heart disease risk change with aging? The Framingham Heart Study.” Circulation 103.9 (2001): 1245-1249. Appel, Lawrence J., et al. “Dietary approaches to prevent and treat hypertension a scientific statement from the American Heart Association.” Hypertension 47.2 (2006): 296-308. Padwal, R., S. K. Li, and D. C. Lau. “Long-term pharmacotherapy for obesity and overweight.” Cochrane Database Syst Rev 4.4 (2003). Rucker, Diana, et al. “Long term pharmacotherapy for obesity and overweight: updated meta-analysis.” Bmj 335.7631 (2007): 1194-1199. Park, Sunmin, Jaeouk Ahn, and Byung-Kook Lee. “Very-low-fat diets may be associated with increased risk of metabolic syndrome in the adult population.” Clinical Nutrition (2015).